Discussion in 'Mattel ThunderCats Toys' started by luketommo2, Nov 3, 2016. Won't be long now as our subscriptions have been renewed and will they be posted together or separately? It will be shipped together. I think it will be delayed as well. I bet they will ship together. I'm very excited for these two. I hope they won't be delayed, but I know better. Well since Lion-O and Jackalman both wound going out the following month of release around the 3rd I know its going to be a safe bet these guys will ship around the same time next Month. Black Panthro, Roadpigjohn, shortfuse and 3 others like this. Thanks for sharing the pics. I really hope a deal with Super 7 can be worked out. The figures look great! Can't wait to get them for sure. Pumyra's artwork on the back of the box is pretty bad though. Not a big deal for me but it looks really weird. That Mumm-Ra looks amazing. Even Pumyra looks fabulous. To me this is a killer line and of course the mezco line (but that is a discussion on another thread). I received my Lion-O a couple days ago and I am inpress with him. I really do hope S7 can continue with the line. Still hate the packaging though. Does anyone know who the artist is for the packaging? I agree with others. The figures look outstanding! I have been waiting a long time for a new Pumyra figure and it appears to be worth the wait. GIVE THEM ALL TO ME NOOOOOOOOOOOOW! not sure but this is interesting. Just imagine if super 7 now get the licence! They keep reusing that artwork over and over. Even the Mezco figures use that artwork. The figures look cool but these bio's are getting worse, who the hell is writing them? The artwork for Pumyra looks like a kid did it. Mumm-Ra's art is pretty awesome but Pumyra looks horrible. Poor Pumyra. Kind of ironic that probably the nicest female face sculpt the 4 Horsemen have ever sculpted gets the worst art work. I don't like criticising someone else's work but that Pumyra art work really does the character no justice. mumm_ra_n_rana, LioConvoy and ThunDerianRoyalGuard like this. That "Pumyra" artwork is inexcusable. The art and the bio really show a lack of passion for and knowledge of the ThunDerCats [brand]. The figure looks good though. I think criticism is fair game, particulary when it's on something I'm paying money for. Do we think this Pumyra is by the same person as the others? I haven't seen this image before and compared to the other characters it looks really rushed. Pumyra should be beautiful which the image is not. Black Panthro, Daremonger, mumm_ra_n_rana and 2 others like this. I agree. 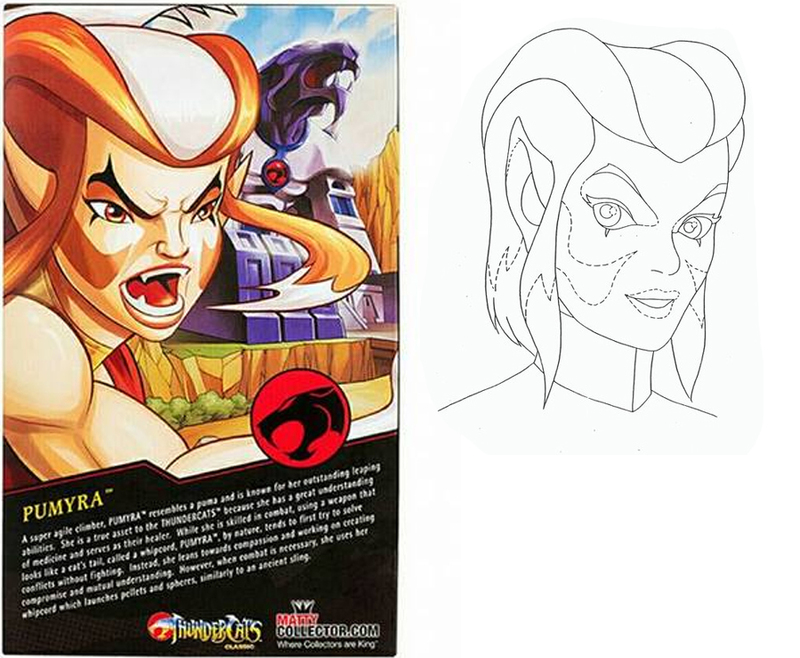 The artist that did this, like Thundarianroyalguard said, obviously has no real knowledge or passion for Thundercats. If the artist did they would know that a fierce battle pose does not suit Pumyra. More to the point the face proportions are all wrong. Daremonger and mumm_ra_n_rana like this.